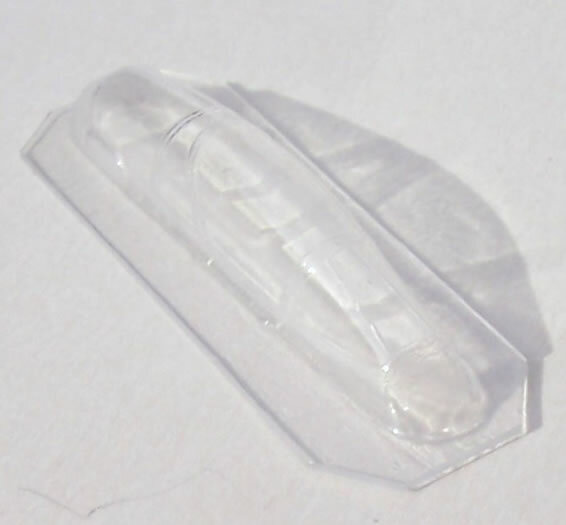 C 72093 16 x resin parts & 1 x vac-form canopy. 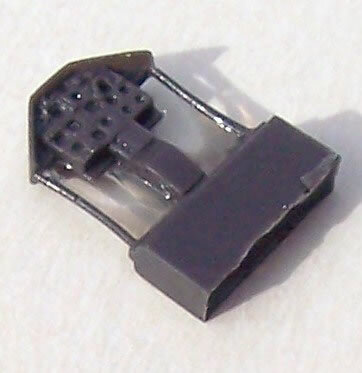 U72-120 9 x resin parts. 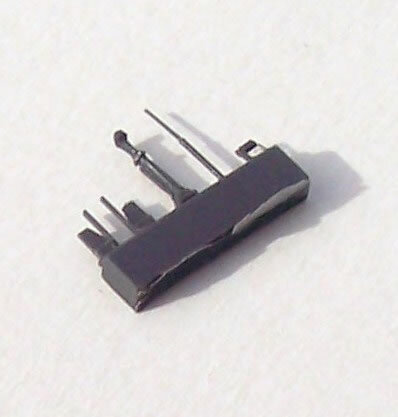 U72-121 1 x resin part. High quality production with excellent instructions where applicable. None readily apparent but make sure you have the kit the cockpit or intake sets is intended for. Good quality components to enhance your Alpha Jet model. The Alpha Jet was one of the two European trainer/light strike aircraft to emerge in the 1970s, the other being the BAe Hawk. The Alpha Jet was a joint project between Dassault-Breguet of France and Dornier of Germany. It first flew in October 1973. It has proven a successful design, and has served with several other nations besides France and Germany. Production wise half as many Alpha Jets have been made compared to Hawks. The Alpha Jet served with France’s national aerobatic team, Patrouille de France, which was originates from 1953. 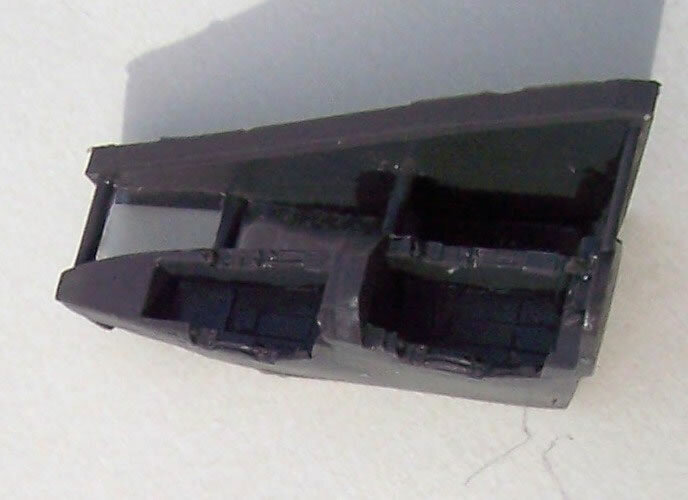 The Alpha jet has been well catered for in 1/72 kit for, with offerings from Matchbox, Fujimi (also re-boxed by Revell), Heller and Airfix. I have seen the last two in this list. 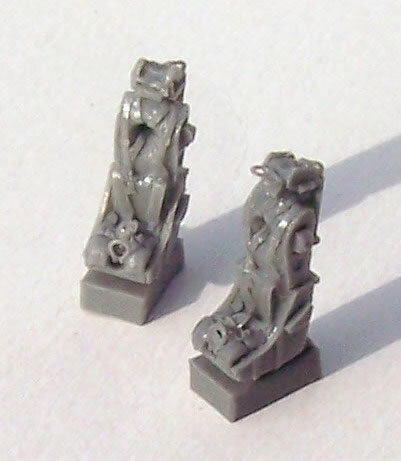 Both are nice kits, from different moulds, with reasonably restrained but mainly raised surface detail. I have not seen the other two in the plastic, only on-line. The Matchbox kit is typically simplified in detail and has Matchobox’s engraved panel lines. The Fujimi kit looks nice with fine engraved panel lines, but in the absence of further information my instincts would lean towards Heller and Airfix for best accuracy. The three European kits have all offered colourful Patrouille de France markings with their kits, and no doubt Fujimi did too. All of the resin is cast to high standards; with some very fine detail (the seats have integrally cast firing handles for example). 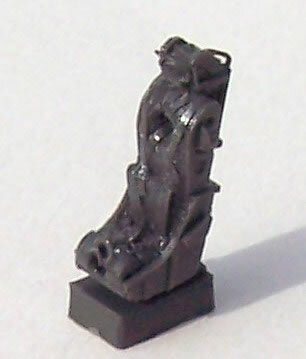 Personally I prefer lighter coloured resin which makes it easier to see the detail. 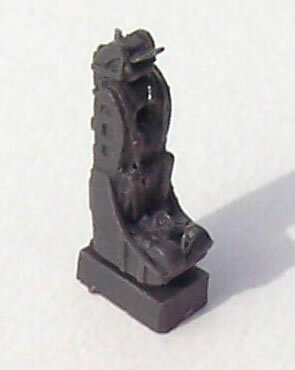 However given that I then often undercoat cockpit interiors and ejection seats in black maybe it doesn’t matter all that much. 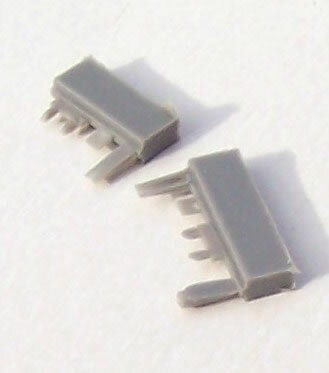 The photos in many ways serve best to review accessory parts, but a few things are worth mentioning. 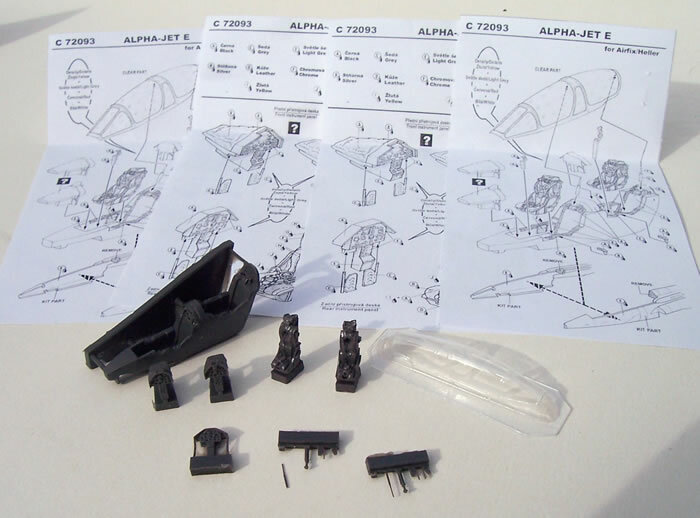 C 72093, the cockpit and canopy set, is comprehensive with good instructions including generic colour call-outs. A choice of front seat instrument panels with and without a gun-sight is offered. The vac-from canopy is well executed as well. If you need a spare it is available from Pavla’s canopy range as V72-71. The seats are very nicely done in my opinion. 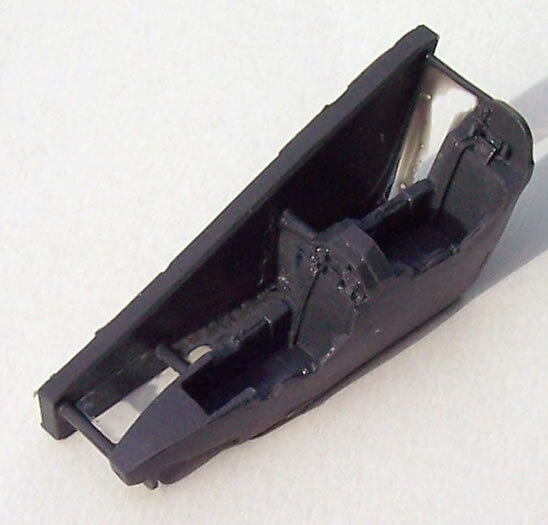 I was at first confused by the header card for U72-120 which reads “Starboard Intake & Exhaust Nozzle”, when in fact port and starboard pairs are provided as you would expect. Perhaps something got lost in translation. 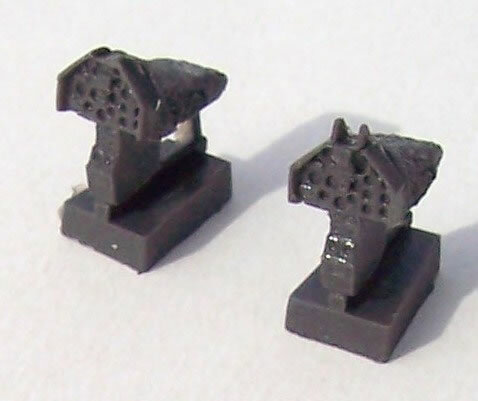 Like the cockpit set, these are advised as being suitable for the Airfix/Heller kit. The photos reveal that the engraved panel line around each intake could use just a little run through with a scribing tool to clear then line in one or two places. 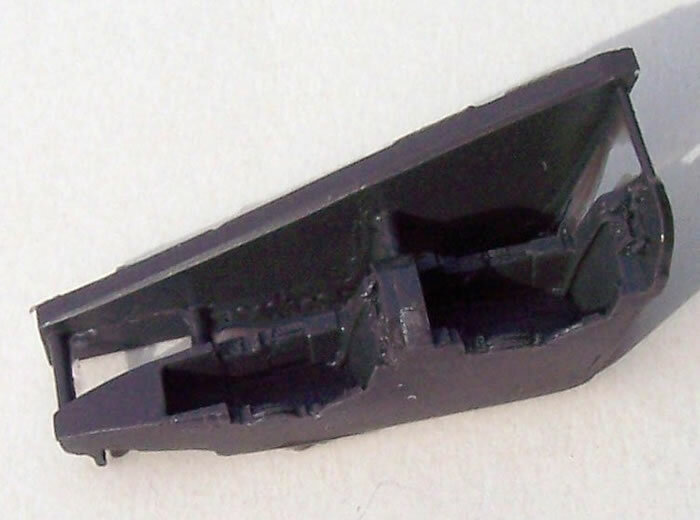 The smoke tank and pair of ejection seats are obviously suitable for any of the four Alpha Jet kits mentioned earlier. However I think that the header card for U72-121 might benefit from the something to indicate that it is a smoke fuel tank, rather than just the words “Patrouille de France”. I stand to be corrected, but I’m sure that original Airfix and Heller kits are unrelated. I understand however that the Airfix kit was offered in Heller packaging when both brands were owned by Humbrol. Presumably it is this boxing that Pavla are referring to when saying their sets are intended for the Airfix/Heller kit. 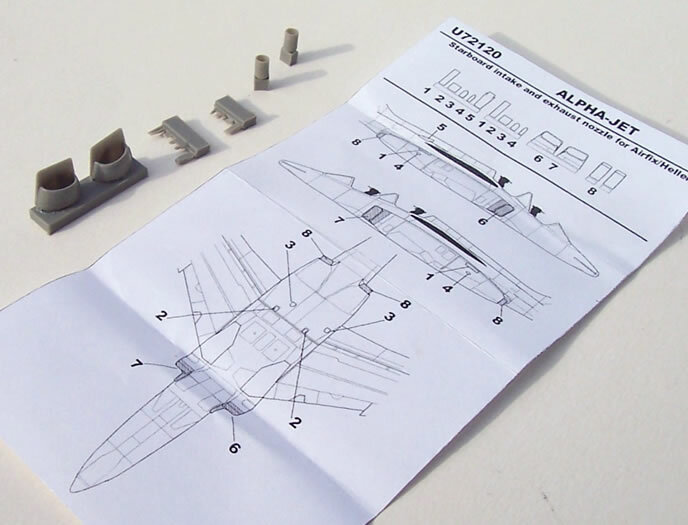 But I suspect that if you have an original Heller Alpha Jet (it may well have medium blue plastic – the one I once had did), it is probably not the kit these sets are intended to fit; so beware. I seem to recall that only the Airfix kit has underwing weapons, so this \be another guide. 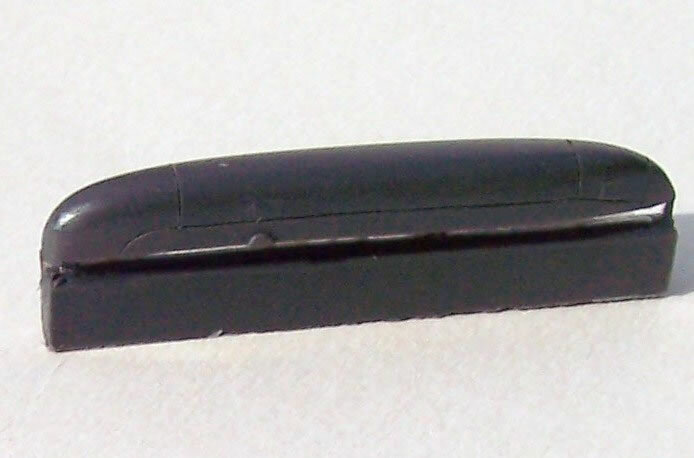 If both companies agreed on the shape, size and break points of the parts covered by the sets may well fit close enough for the original Heller kit. I’m unaware if the new Hornby owners of Airfix have re-released the Airfix Alpha Jet yet. Pavla should double check their Czech to English translating when it comes to printing, and consider using more complete descriptions on header cards in the case of the smoke tank. 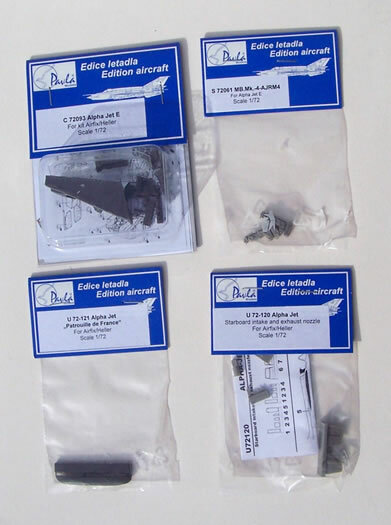 Be aware that the Airfix/Heller Alpha Jet kit Pavla’s sets are intended for would most likely be the Airfix moulding in either Airfix or Heller boxings. They may not be a ready fit with the original Heller tooled kit, but no doubt they could be adapted. I should think that the vac-form canopy would be the most critical item fit-wise if you have the true Heller kit. 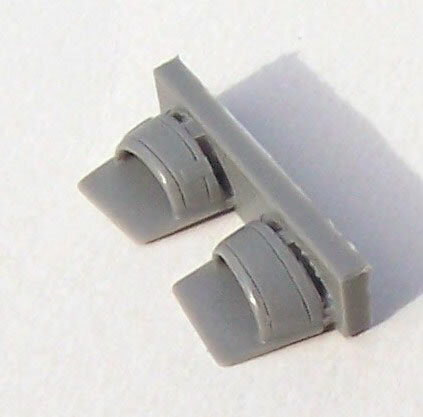 Putting my concerns aside about Airfix and Heller permutations, these are high quality sets enabling the modeller to choose the level of detail intended or dictated by budget. They compliment some already quite nice kits in a sensible way: Recommended.